We even had fireworks this year. Bam went over the border to get them and Charlie set them off in the driveway. One of them was really loud. I hope it didn't scare our neighbor's dogs. I don't think Weezie even heard it. She was in the basement out of the rain for a while. We had good food from The Firehouse - sandwiches. I made spiced up canned baked beans with bacon, and Mom's salad. And of course we made ice cream -- vanilla and chocolate. I forgot to put the vanilla in, but both kinds were good without it! That makes them just sugar and heavy cream, one with cocoa sifted into the sugar. Interesting! I guess that's all ice cream is -- sweetened cream churned with salted ice. Delicious. Amy and Wes went for the sandwiches, then Bam arrived with Charlie. Marykay is in Dubai, of all places. Sure hope she behaves well over there. She's sent back great pictures to Facebook. I've been going through pictures, making a book for Wes, not a fancy book, just slipping the originals into a haphazard collection. 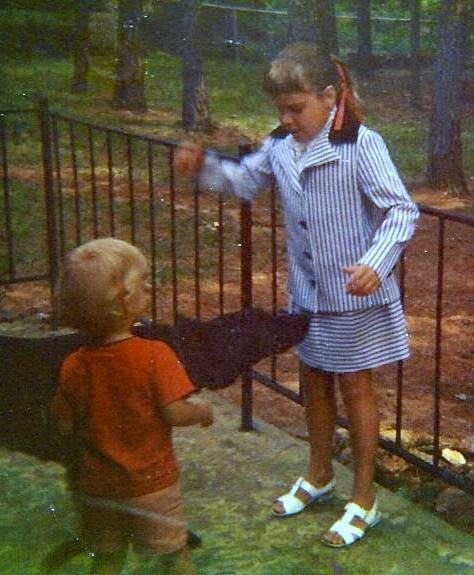 All the pictures of his childhood with Amy are here, so I'm just putting some together for him. He'll get them all one day, but sometimes when you're young you throw things away.